Although several meta-analyses have demonstrated the utility of intravascular ultrasound (IVUS) in guiding drug-eluting stent (DES) implantation compared to angiography-guidance, there has been a dearth of evidence in the left main coronary artery (LMCA) lesion subset. We performed a meta-analysis to compare clinical outcomes of IVUS versus conventional angiography guidance during implantation of DES for patients with LMCA disease. Pubmed, Cochrane Library, Embase were searched. A total of 1002 publications were reviewed; and finally, seven clinical studies - one prospective randomized controlled trial and six observational studies with 4592 patients (1907 IVUS-guided and 2685 angiography-guided) - were included in the meta-analysis. IVUS guidance was associated with a significant reduction in major adverse cardiac events (relative ratio [RR] 95% CI 0.61; 95% confidence interval [CI] 0.53 to 0.70; P < 0.001), all-cause death (RR 0.55; 95% CI 0.42 to 0.71; P < 0.001), cardiac death (RR 0.45; 95% CI 0.32 to 0.62; P < 0.001), myocardial infarction (RR 0.66; 95% CI 0.55 to 0.80; P < 0.001), and stent thrombosis (RR 0.48; 95% CI 0.27 to 0.84; P = 0.01) compared with angiographic guidance. However, there was no significant difference regarding target lesion revascularization (RR 0.60; 95% CI 0.31 to 1.18; P = 0.099) and target vessel revascularization (RR 0.64; 95% CI 0.26 to 1.56; P = 0. 322). Compared to angiographic guidance, IVUS-guided DES implantation was associated with better clinical outcomes for patients with LMCA lesions, especially hard endpoints of death, myocardial infarction, and stent thrombosis. Intravascular ultrasound (IVUS) has played a key role in contemporary stent-based percutaneous coronary interventions (PCI) by providing more detailed coronary anatomic information, assessing plaque burden accurately, selecting proper stent sizes, and optimizing stent expansion, apposition, and geographic miss [1–5]. One meta-analysis of seven randomized trials in the bare metal stent era  and seven meta-analyses including both registries and randomized studies [7–13] in the drug-eluting stent (DES) era concluded that IVUS guidance improved patient outcomes compared to angiography guidance alone. However, and with one exception, these previously published meta-analyses did not address stent implantation to treat the subset of patients who present for PCI of left main coronary artery (LMCA) lesions; and there is increased interest in PCI intervention for LMCA disease since the results of two randomized DES versus bypass surgery studies – EXCEL and NOBLE – were recently presented [14, 15]. 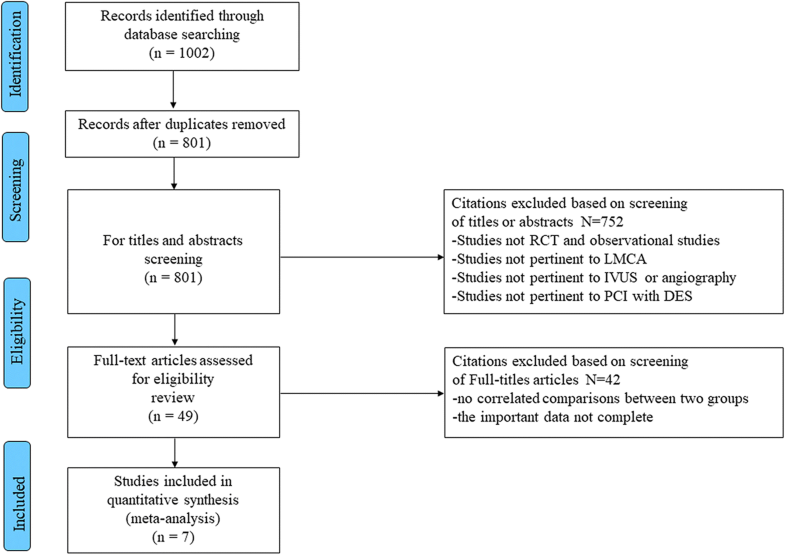 Therefore, we performed the current meta-analysis of published studies comparing IVUS-guided versus angiography-guided DES implantation to treat LMCA lesions. A computerized search was performed of Pubmed, Cochrane Library, Embase from January 1993 to October 2017. Mesh and combinations of the following terms were used in the search process: “ultrasonography, intravascular,” “intravascular ultrasound,” “intravascular ultrasound-guided,” “IVUS,” “IVUS-guided,” “angiography,” “angiography-guided,” “left main coronary artery,” “left main coronary stenosis,” “left main coronary disease,” “left main,” “left main lesion,” “LMCA,” “drug-eluting stent,” “sirolimus-eluting stent,” “paclitaxel-eluting stent,” “everolimus-eluting stent,” “zotarolimus-eluting stent,” “stent,” and “DES.” Two investigators (Yue Wang* and Yue Qi) independently screened the titles and abstracts and eventually examined the full texts of the original reports included in the study. Additional searches for potential studies were performed by reviewing the references of earlier meta-analyses concerning IVUS versus angiography-guided DES implantation. Complete data were retrieved from the studies for quantitative synthesis. In addition, studies with incomplete information - including abstracts of major meetings (Transcatheter Cardiovascular Therapeutics [TCT], Angioplasty Summit, American Heart Association [AHA], American College of Cardiology [ACC], EuroPCR, and World Congress of Cardiology [WCC]) and studies of IVUS versus angiography-guided DES implantation that included a subgroup of LMCA patients - were reviewed for other potentially relevant citations. Final inclusion of studies was based on the agreement of both reviewers. Randomized control trials (RCTs) and observational studies in English language were considered while studies in the non-English language literature were not included. Studies met the following pre-specified criteria: 1) clinical studies published in peer-reviewed journals with fully available data; 2) studies that included a comparison of IVUS-guided versus angiography-guided PCI with DES in LMCA lesions; and 3) follow-up time of at least 12 months. Reports of mixed treatment with bare-metal stent and DES implantation without separate clinical outcomes for the DES subgroup were excluded. Within this study,  patients (n = 1899) predominantly underwent DES implantation, with BMS implanted in only a small proportion of the study population (IVUS-guided arm: 1.3%, angiography-guided arm: 3.0%). It was therefore deemed appropriate to include this study in the meta-analysis. In addition, studies with incomplete data were reviewed and later discussed, but not included in the formal meta-analysis. The primary endpoint in this meta-analysis was major adverse cardiac events (MACE), defined as the composite of death, MI (myocardial Infarction), and repeat revascularization. The secondary endpoint was all-cause death, cardiac death, MI, target lesion revascularization (TLR), target vessel revascularization (TVR) and stent thrombosis (ST; included definite, probable or possible ST) according to the definition of the Academic Research Consortium . We extracted DES data exclusively, thereby excluding bare metal stent data. The study’s first author’s name, publication date, study design, and follow-up duration; baseline clinical, angiographic, and procedural characteristics; and clinical outcomes were systematically reviewed and recorded by the same two reviewers (Yue Wang* and Yue Qi). Disagreements were resolved by discussion between them. The methodological quality of RCTs was assessed by the Cochrane Collaboration Risk of Bias tool . The methodological quality of observational studies was assessed by the Newcastle-Ottawa scale (NOS) that consists of three factors: patient selection, comparability of the study groups, and assessment of outcomes . A score of 0–9 was allocated to each study except RCTs. Observational studies achieving six or more scores were considered to be of high quality . 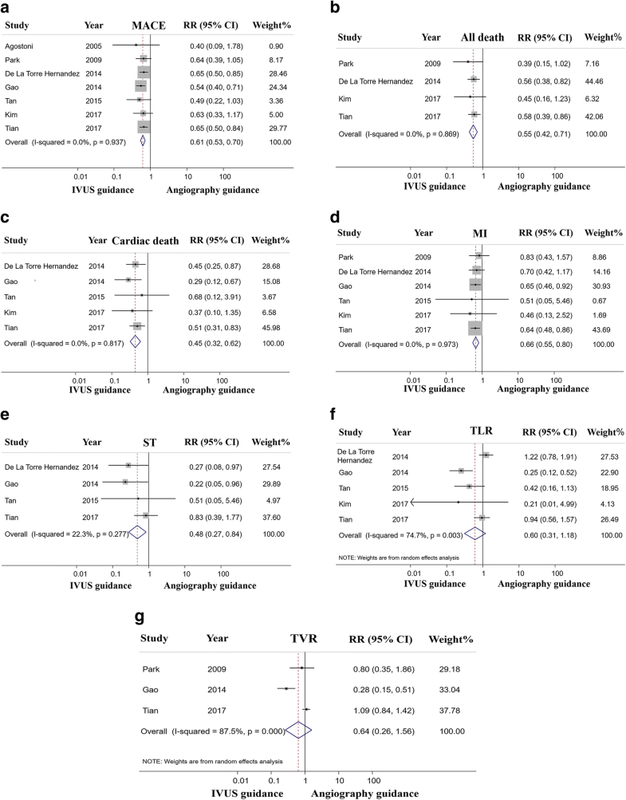 Baseline characteristics between IVUS-guided versus angiography-guided groups were analyzed and compared, with mean ± SD for continuous variables using two-sample student’s unpaired t-test and proportions for categorical variables using chi-square statistics. Across-study summary relative ratios (RRs) with 95% confidence interval (CI) were produced to assess the efficacy of IVUS versus angiography guidance on adverse clinical events. The statistical heterogeneity between trials was assessed with chi-square tests and I2 statistics. When the p value of chi-square test was < 0.10 and/or the I2 was ≥50%, significant heterogeneity was considered and a random-effects model would be selected. If not, the fixed-effects model was used instead. Egger’s linear regression analysis was performed to quantitatively assess the underlying publication bias across the studies. In order to evaluate the stability and reliability of the primary endpoint result, we performed a sensitivity analysis of MACE by omitting each individual study in turn. All reported p-values were 2-sided, and P < 0.05 was considered to indicate statistical significance. All statistical analyses were performed using STATA 14.0 (Stata Corp, College Station, TX, USA). A total of 1002 publications were reviewed, and 801 citations were screened by checking the title or abstract. Of these, 49 studies were reviewed in detail; and seven clinical studies (4592 patients) were included in the current formal meta-analysis, [16, 21–26] in which 1907 patients underwent IVUS-guided PCI and 2685 underwent angiography-guided PCI with DES implantation. (Fig. 1) One study was a RCT,  and the other six studies were observational registries [16, 21–24, 26]. Four studies performed propensity score matching [16, 22, 23, 26]. As specified in the Methods, one meeting abstract published in 2016 (Effectiveness and safety of intravascular ultrasound guidance on clinical outcomes following drug-eluting stent implantation in unprotected left main coronary artery) and one study  that included LMCA subgroup analysis were reviewed in the Discussion, not included in our meta-analysis. Baseline characteristics of the included studies have been shown in Table 1. The follow-up time ranged from 12 to 36 months. Of the seven studies, the follow-up time in four was 36 months. There were no statistically significant differences in the baseline characteristics between the IVUS-guided versus the angiography-guided groups, except for age, left ventricular ejection fraction and previous PCI. Table 2 demonstrating angiographic and procedural characteristics. Four studies mainly used first generation DES [21, 22, 24, 25], and both first and second-generation DES were implanted in two studies [16, 26]. However, one study did not report the type of DES . Most studies were frequent use of a two-stent technique except for one study by Kim . Table 3 presented quality assessment results of included observational trials. Among the six observation studies, all had a scoring of ≥6. The summary risk of bias of the RCT study was low. All studies were considered to be of high quality. Analyses for clinical outcomes have been presented in Fig. 2. The definition of MACE was slightly different across studies; two studies included cardiac death, [21, 25] and the other five included all-cause deaths [16, 21–24, 26]. Three studies reported TVR, [21, 22, 24] two reported TLR, [23, 25] and one study reported any revascularization not restricted to the target lesion  (Table 4). MACE was reported in all seven studies (Table 5), the summary RR was 0.61 (95% CI 0.53 to 0.70; P < 0.001) in favor of IVUS-guided DES implantation. No evidence of statistical heterogeneity was noted among the included studies (I 2 = 0%; P = 0.937) (Fig. 2a). Four studies reported all-cause death and indicated that IVUS-guided DES implantation was associated with a significant reduction of all-cause mortality (RR 0.55; 95% CI 0.42 to 0.71; P < 0.001) with no statistical heterogeneity across the studies (I 2 = 0%; P = 0.869) (Fig. 2b). Of the seven studies, five were included in the analysis of cardiac death; the risk of cardiac death was significantly lower with IVUS guidance (RR 0.45; 95% CI 0.32 to 0.62; P < 0.001) with no statistically significant heterogeneity (I 2 = 0%; P = 0.817) (Fig. 2c). Six studies were applied to the analysis of MI. The result was significantly in favor of IVUS-guided DES implantation (RR 0.66; 95% CI 0.55 to 0.80; P < 0.001) with no heterogeneity (I 2 = 0%; P = 0.973) (Fig. 2d). Data on ST was reported in four studies. In PCI with DES implantation, IVUS-guidance markedly lowered the risk of definite/probable ST compared with the angiography guidance group (RR 0.48; 95% CI 0.27 to 0.84; P = 0.01), again with no statistical heterogeneity (I 2 = 22.3%; P = 0.277) (Fig. 2e). Six studies reported data regarding TLR and three reported TVR. Due to significant heterogeneities (TLR I 2 = 74.7%; P = 0.003, and TVR I 2 = 87.5%; P < 0.001), random effects models were used to estimate the summary effect of all studies. There were no significant statistical differences regarding TLR (RR 0.60; 95% CI 0.31 to 1.18; P = 0.099) and TVR (RR 0.64; 95% CI 0.26 to 1.56; P = 0. 322) between the two groups (Fig. 2f and Fig. 2g). Sensitivity analysis regarding the primary endpoint MACE has been presented in Fig. 3. After removing each study in sequence, the results were not statistically different from the summary RR across the seven studies, further indicating that IVUS-guided DES implantation was associated with a significant reduction in MACE. Because only seven clinical studies were included the current meta-analysis, we assessed the asymmetry of publication using quantitative tools. No significant evidence of publication bias (P = 0.401 for MACE, P = 0.058 for all death, P = 0.709 for cardiac death, P = 0.842 for MI, P = 0.338 for ST and P = 0.75 for TLR) were observed on the basis of Egger’s test (Fig. 4). This meta-analysis of seven studies consisting of 4592 patients demonstrated that IVUS-guided DES implantation when treating LMCA lesions was associated with a significantly reduced risk of MACE, all-cause death, cardiac death, MI, and ST, when compared with angiography-guidance. Using coronary angiography, LMCA lesions may be obscured by overlapping vessels, streaming of injected contrast, and lack of a normal reference segment that limits the utility of angiography in determining lesion severity and selecting treatment strategy . A study by Chakrabarti demonstrated that 11.2% (17 of 152) patients with LMCA disease by core laboratory assessment were deemed normal by clinical assessment in the National Cardiovascular Data Registry (NCDR), whereas 56.7% (177 of 312) patients having significant LMCA disease by clinical assessment in the NCDR had no LMCA lesions by core laboratory analysis . In addition, visual inspection of the angiogram may result in an incorrect diagnosis of LMCA disease severity. In one study including 213 patients with LMCA stenosis, 23% of patients had a diameter stenosis < 50% on the angiogram while the FFR was < 0.80, who actually had hemodynamically significant stenosis and needed revascularization . Conversely, IVUS can detect significant narrowing and assess angiographically ambiguous LMCA lesions;  and IVUS correlates with FFR . IVUS has been used to guide decision-making with regards to PCI or bypass surgery in patients with LMCA disease . IVUS also has the ability to assess LMCA plaque distribution and predict hemodynamically significant jailing of the left circumflex after single stent cross-over in a manner not possible using coronary angiography [34, 35]. More importantly, IVUS can assess stent underexpansion, incomplete lesion coverage (ie, large residual stent edge plaque burden), and malapposition in both LMCA and non-LMCA lesions after DES implantation [36, 37]. Optimal DES implantation is the key to improved patient outcomes. A multivariable logistic regression model of PCI treatment of LMCA lesions showed that IVUS-determined stent underexpansion was an independent predictor for MACE (adjusted hazard ratio [HR] = 5.56; P < 0.001); and the two-year MACE-free survival rate was significantly lower in patients with underexpansion of at least one segment versus lesions with no underexpansion (90% vs 98%; P < 0.001) . The current meta-analysis demonstrating that IVUS-guided DES implantation led to a significant reduction in the incidence of MACE compared with angiography guidance. This has also been seen in several abstracts at major meetings, and in LMCA subset analyses of larger IVUS versus angiography-guided DES implantation studies. For example, a recently published summary in WCC_2016 concluded that the risk of MACE was significantly lower in LMCA lesions stented with IVUS guidance (15%) vs angiography guidance (24%) (X2 = 42.76; P = 0.009). In addition, the subset analyses of LMCA patients in the ADAPT-DES study also showed a trend toward a reduction in MACE (HR 0.54; 95% CI 0.23–1.26; P = 0.15) . The beneficial results of IVUS-guidance demonstrated in the current meta-analysis were mainly related to the lower risk of death and MI. In addition, the use of IVUS was associated with a lower ST risk than reliance on angiography. Considering that ST within LMCA stents may present as sudden death, the incidence of this complication may have been underestimated, but was likely captured in the assessment of patient mortality and/or MI . However, we found that IVUS guidance did not reduce TLR or TVR. This may be attributed to the fact that underpowered study population, low incidence of events and the discretion of the operator who might prefer IVUS guidance for lesions with more complex coronary anatomy. This meta-analysis had the following limitations. Firstly, only seven studies were included in our meta-analysis; and only one was an (admittedly relatively small) RCT. Indeed, observational studies have significant limitations with selection and ascertainment bias, which influenced the quality of the evidence across studies. In the present meta-analysis, four of six observational studies included propensity score matching to reduce selection biases. Moreover, IVUS-guided DES implantation was still associated with a significant reduction in MACE after sensitivity analysis was performed. The result indicated that IVUS was worthy of being recommended while performing DES placement for LMCA. However, adequately powered, large-scale RCT studies are needed. Secondly, the location of LMCA lesions, the numbers of other diseased vessels, DES type, and specific treatment strategies may also have impacted the clinical outcomes; but most studies did not provide this detailed data so that subgroup analyses could not be conducted. Thirdly, this meta-analysis lacked the power to detect meaningful differences in TLR and TVR due to little sample size and significant heterogeneities. The current meta-analysis and systematic review of the literature demonstrate potential clinical value of IVUS in guiding DES implantation for LMCA patients by a significantly reduced risk of MACE, all-cause death, cardiac death, MI, and ST compared with angiography guidance alone. Future studies are warranted as more data becoming available. This study was supported by grants for National Natural Science Foundations of China (NSFC, Grant No. 81470492 and 81670317) and Beijing Administration of Foreign Experts Affairs (GDJ-20171100001). YW, XFW and ZCG designed the study; YW, ZCG and YQ acquired, analyzed, and interpreted data; YW and MRL drafted the manuscript; YW and YQ did the literature search and study selection procedures; MSG and XFW did critical revisions for important; All authors read and approved the final manuscript. Yue Wang (first author) is a postgraduate student of grade 2016; Yue Wang (fifth author) is a postgraduate student of grade 2017. Dr. Mintz receives grant support and/or honoraria from Boston Scientific, Volcano, and ACIST. The other authors have no potential conflicts of interest. Wells GA, Shea B, O'Connell D, Tugwell P. The Newcastle-Ottawa Scale (NOS) for assessing the quality if nonrandomized studies in meta-analyses Available at: http://www.ohri.ca/programs/clinical_epidemiology/oxford.htm. Accessed 19, Oct 2009.